At the meeting of Swale Borough Council’s Planning Committee on Thursday 30 October, where permission was granted to rubber stamp the building works at Baltic House and grant planning permission again despite ongoing enforcement matters (presumably the illegal work without planning permission or listed building consent to connect to mains drainage), another big issue for Swale was discussed which is of great relevance to the thinking behind our developer led Neighbourhood Plan. The prime reason for allowing increases in land values is so that development cash can be injected into infrastructure projects for the Creek? Is that right? We all know that is tosh because any sums thought of in the first place would only ever be enough to fund cosmetics such as neat moorings, tidy paths and surfacing with maybe a mooring post or two and a few affordable houses. Well, if the negotiations with the Paper Mill site in Sittingbourne are anything to go by this is pie in the sky in an improbable galaxy way beyond our properly researched and evidence-based hopes for a working creek. The excitingly named Essential Land are negotiating and Swale are in a very very weak position and are having to agree to vast reductions in their promises. There are now only 5 affordable units (3% of the total), they are asking to be excused from education contributions, rescheduling landscaping, renegotiating underpasses, and – as for the heritage bits, well that was not apparently even worth discussing as the other losses outweigh them – arguing that their profit levels forecast in 2012 to be at a level which would allow all this loveliness have dropped below the 20% of final sale value that they are apparently entitled to. Gosh, who knew the housing market was sinking so fast? When will Councillors learn not to trust developers’ promises? This entry was posted in Forum, Neighbourhood Plan, Standard Quay on November 3, 2014 by Visions of a Creek. This is somewhat disturbing. There is only one possible source for this statement: an email which was not addressed to you, did not mention you and was none of your business, so I wonder how you obtained it. I note that the email was copied to Faversham Town Council via the Town Clerk. Do you have access to information your wife receives in her official capacity? I think we’d all appreciate reassurance that our correspondence with the Town Council is treated with the utmost discretion, and that your very strong views on the subject of the Neighbourhood Plan and individuals involved in the debate do not in any way compromise the scrupulous impartiality expected of the Town Clerk in her dealings with members of the public. This entry was posted in Forum on July 3, 2013 by Visions of a Creek. Thank you again for letting me have print-outs of the panels which were on display at the recent Neighbourhood Plan exhibition at the Alexander Centre. I could not possibly have commented on these in a properly informed fashion without having them all to hand. In this respect I may not be alone. There is no substitute for the coherence of what in fact are pages from a book. Perhaps you will be kind enough to refer the following response to the Group and invite its members to given them due consideration? I will also let you have them in the form of a letter. An acknowledgement would be valued. I don’t propose to comment on the panels in detail. This I am afraid is because I feel the thinking behind them is fundamentally flawed. It grieves me to say this, because clearly the Steering Group has given a lot of thought to its brief, and invested a significant amount of public money in developing its vision of the future of the Creek’s riparian areas, or at least those that it considers are ripe for ‘regeneration’ (though this is not a term I myself would use for some of the developments envisaged). The fundamental flaw which has clearly informed the Group’s thinking is that it has chosen to regard the Creek as a street, like one in suburban London, perhaps, alongside which there are plots with potential for housing development. However the Creek is not a street. It is a highway to the sea, and to the world beyond our island. It has served as such for centuries, since Roman and probably also pre-Roman times. In this Kingdom there are hundreds of thousands of urban streets, many no doubt with frontages with potential for redevelopment. There are far fewer navigable waterways, like the Creek, with access to the sea and the world beyond. These represent a precious, irreplaceable asset which deserve to be treated with all the care we can lavish on them. You can’t berth vessels, or build or maintain them, alongside urban streets. If there are any vacant Creekside sites, or ones that might be suitable for development, the Steering Group would be better advised to look for development which would serve maritime rather than residential purposes. Also, given that the Faversham area has lost many employment opportunities in recent years, it would be better advised look for developments which would replace some of the many which it has lost. Though it may not have been intentional, the exhibition could have given the very misleading impression that the only potential use for the sites identified (rightly or wrongly) as needing ‘regeneration’ was for the building of new dwellings. These would not generate much-needed new local employment opportunities, only make Faversham more of a dormitory town than it is already. This would be inherently undesirable because of all the extra travel involved, of increased strain on local public transport facilities, and of excessive and unnecessary use of fossil fuels. The Steering Group may of course have been misled by Swale Borough Council’s Strategic Housing Land Availability Assessment (SHLAA), which identified some of the Creek’s riparian areas as having potential for the provision of 100 new dwellings. So indeed it did, but such identification did not carry with it any commitment to grant of planning permission. Equally the Group may have taken into account that if any appropriate planning permissions were given developers would be liable to Community Infrastructure Levy (CIL). It’s unclear what this would yield. To take a cockshy based on the old section 106 contributions which developers had to pay, the maximum yield might in the region of £7,000 per new dwelling. Of this, subject to the approval of a Neighbourhood Plan, the town of Faversham might get £1,750 per unit, the rest going to Swale Borough Council. If all 100 dwellings were built alongside the Creek, the yield would be £175,000 at most. In relation to the loss of sites which could be used for maritime uses this is a paltry sum. There is every indication that if the Creek were regarded as a highway to the sea and not as a suburban street with potential for residential development the potential of its riparian areas for maritime uses is substantial. Interest in, and use of, traditional vessels in increasing whilst at the same time the number of moorings and ‘service areas’ in and around the Thames Estuary is declining. This presents an outstanding opportunity for the Creek to offer berths, and services, no longer available elsewhere. Such provision would increase opportunities for skilled employment, and much-needed apprenticeships in appropriate skills. Indeed Faversham Creek could become a Mecca both for owners of traditional vessels, and for the crafts required for their maintenance. Given that the general public are fascinated by these vessels, and that many of them are of charm, or beauty, or both, their presence, and that of supporting craft skills, would substantially reinforce the town’s already significant visitor offer, benefitting its economy, and particularly its shops, pubs and eating-places. To my surprise, the exhibition failed to put the Creek in its geographical and historical context. Consideration and evaluation of this should surely be the very starting-point for the Neighhourhood Plan. You can’t possibly plan properly for the future without full understanding of the physical character and the past (including the recent past) of the area concerned. What thought the Steering Group has given to this I’m afraid isn’t at all clear. Little, I am tempted to think. The Creek of course is inseparable from the town. Indeed Faversham would not exist but for the Creek. For centuries it was its lifeblood. It bred hardy seamen, fit for service in the Cinque Ports fleet, fit to save the nation from invasions which would have altered its destiny for ever and for the worse. It generated much of its wealth, and this is reflected today by the number of 16th and 17th century merchant houses which remain in the town centre and are a vital feature of its charm and distinctive character. Unfortunately this kind of public-spirited personal generosity seems to be in small supply these days. However the pulling-power of the town’s community remains strong, and if through the Steering Group it put its mind to the Renaissance of the Creek for maritime purposes, and not for sterile housing development, it could only improve the town’s economy and standing. This entry was posted in Forum, Neighbourhood Plan on June 27, 2013 by Visions of a Creek. Why does the Neighbourhood Plan ignore AAP2? I am deeply confused. I keep hearing that we have to have this Neighbourhood Plan to protect the Creek against unbridled development and yet I cannot imagine development more unbridled than what is presented in the Neighbourhood Plan.Surely housing on every available site qualifies as unbridled development? What is the worst case scenario supposed to contain? 1960s tower blocks? Multi storey car parks? I may be lacking in imagination but surely what this plan presents is the likely ‘unbridled development’. Isn’t it supposed to help us defend the spirit and letter of the 2008 policies which specifically state that the Creek has already reached saturation point as regards housing if it is to have any hope of seeing the fledgling revival in maritime activities grow to its full exciting potential? We keep getting told we have to be scared of the new National Planning Policy Framework, and that the 2008 Plan is now no longer the relevant framework.But from my, admittedly amateur, reading, there is little here to be scared of and every reason to use it to strengthen the protection that Area Action Plan 2 in the 2008 plan gives the creek. Indeed in December last year, Swale received notice from central government which policies were compatible with the NPPF and could therefore be used as planning policy documents after March 2013. This document listing all the policies and stating if they are compatible was an appendix to a meeting of the LDF panel on 12 December last year. None of this looks like the basis for panic. In fact, it looks reassuringly as though, if we wished to do so, we could use all the protection of the 2008 plan to fight housing development on the Creek.Why are we not only giving in to development pressure, but actually passing a message that we want to encourage it? I had understood that the Neighbourhood Plan process was taking over from the requirement in the AAP2 that a planning document needed to be produced. My understanding was that this should build on the policies and at least the principles embodied in the action plan rather than, as seems to have happened, wipe out all the principles that AAP2 represents and go against its letter and spirit. I am very puzzled and hope that someone can explain, perhaps using the documents I have referred to and any others which are relevant, why it is that we have to have yet more housing so densely packed along the creek despite this being discouraged in the currently enforceable Local Plan. This entry was posted in Forum on June 9, 2013 by Visions of a Creek. So what are the inaccuracies in the film Visions of a Creek? I was at the Opening of the Purifier Building yesterday evening, the Lord Warden of the Cinque Ports spoke eloquently about the importance of shipbuilding in Faversham to our national history through so many important battles .It was good to see the completion of Phase 1 and to see what has been achieved by the workers who have brought the building back to industrial use. There are still people muttering on about inaccuracies in the film . But the mutterers do not seem to be able to say what the inaccuracies are. We need to challenge them to “put up or shut up”. If there are inaccuracies post them on this site and hold the film maker and the speakers to account. It seems to me the mutterers have not noticed that the film was called Visions of a Creek; recognising that there are many visions of what the future of the creek should be. That is why there is debate. That is what happens in democracies. The mutterers, many of whom are in positions of power in the town, should be challenged. If there are inaccuracies they need to say what they are and stop this unworthy muttering campaign: “put up or shut up”. When you hear the muttering challenge it. This entry was posted in Forum on May 31, 2013 by Visions of a Creek. Who is behind the Planning Help website? Why, it’s the Campaign to Protect Rural England! The CPRE were brought in as advisors to our Neighbourhood Plan steering group. They were involved in the “stakeholder” workshop last November, and in drawing up the communications and engagement strategy. If anyone can see how the advice given above is reflected in what our steering group is doing, could they please let me know. This entry was posted in Forum on May 26, 2013 by Visions of a Creek. Hello? Earth to steering group: is anybody listening? I am one of the moderators of this site. When I put up posts as Visions of a Creek I make every effort to be even-handed when reporting events or raising issues for debate. This is not one of those posts. This is a personal view. 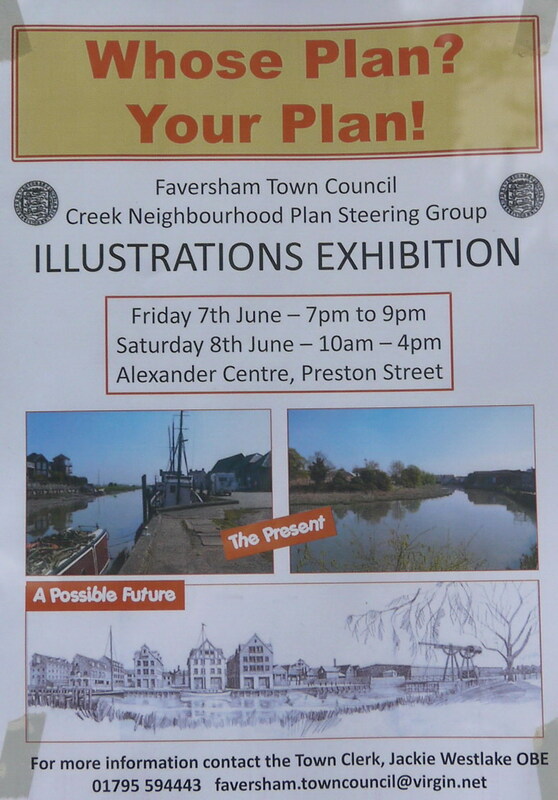 For many months now, people have been voicing their concerns about lack of consultation over the Faversham Creek Neighbourhood Plan. The response of the steering group developing the plan has been to plough on regardless, denying that there is a problem. They point to the May 2012 exhibition (and to the November 2012 “stakeholder” workshop) as evidence of how assiduously they are consulting. Group leader Nigel Kay says in a letter to a newspaper in January 2013 “the plan has not been drawn up yet, so there is nothing to consult on”. Time and time again we’ve been told to shut up and wait for the “illustrations exhibition”. Posters advertising this exhibition are now appearing. And what’s on them? An illustration of the view across the creek from Front Brents, with three big, bulky four-storey blocks of flats crammed in, right up to the waterfront, on the site which currently houses the Wilkinson Sails business. These buildings loom oppressively over the creek at a point where the channel is very narrow. They box in Town Quay and are completely out of scale with TS Hazard and the other buildings there. They are equally out of scale with, and overlook, the attractive Victorian terrace on the opposite bank. They destroy a pleasing oasis, where many visitors get their first view of the creek; where people come to stroll or sit on the grassy banks opposite, enjoying the open aspect across the creek to low buildings set well back from the water, an interesting roofscape, the distinctive spire of St Mary’s church – all of which will be lost if this development is allowed to proceed. You wouldn’t know this from looking at the poster, though. It shows “before” and “after” images, but the “before” images are of a completely different part of the creekside. It does not show an honest contrast between the view of the proposed development and the view it would replace. Read the feedback from the May 2012 consultation event. Make a note of the number of people – including those who were prepared to accept the concept of “mixed development” – who said (1) employment should take precedence and housing should be confined to sites unsuitable for employment use, (2) employment and residential use should be kept separate, not combined on the same site, (3) any development should be small-scale, low-rise, in keeping with its surroundings, and (4) no large blocks of flats. What do we see here? Large blocks of flats on a site which is not merely suitable for employment use but is actually being used for that purpose right now. The drawings for this exhibition are said to be “indicative” only, and I have not seen the others – but how can the steering group even consider a development of this kind on this site, given the comments made at the May exhibition? Did the members of the group ever seriously evaluate the feedback and incorporate it into the development of the plan? There is no record of this in the minutes of their meetings. Was the feedback presented and discussed at the “stakeholder” event? There is no record of this in the report. Inviting people to an exhibition is not consultation. It only becomes consultation if you then take account of what those people say. On the evidence of the poster illustration, the May 2012 exhibition – the only public event that’s been held in almost two years since the Neighbourhood Plan first got the go-ahead – was not a consultation. Can we trust this steering group? Can we have any confidence that anything we say will make a blind bit of difference? Go the exhibition anyway. See what you think. Say what you think. And say it loudly, so it can’t be ignored. This entry was posted in Forum on May 25, 2013 by Visions of a Creek.